There two bottles today as I made a mistake when ordering it seems 🙂 Also hello from up north! The final drink of this years advent calendar is Weird Beard’s Black Christmas. A cranberry stout at 4.5%. I can’t really tell the cranberries but you can taste the hops! I’m also getting a little bit of chocolate. It’s a rather pleasant stout. I’d happily have more. Well this advent calendar was rather fun. 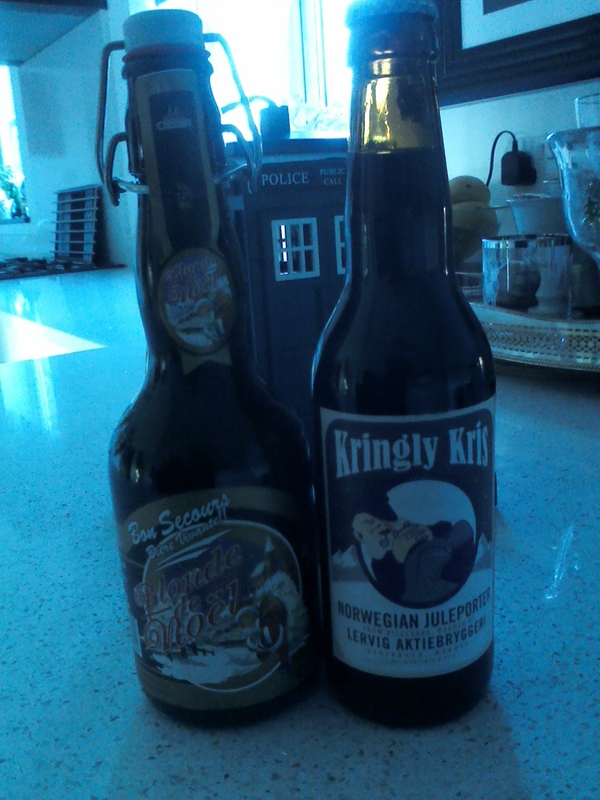 I don’t think I’ll get a selection of Christmas beers next year as they tended to be rather similar. I’m lucky that apart from the one that clearly was off before it got to me that none of the beers were bad. Have a good Christmas and we will be back in the New Year. And here is the latest in the line of Christmas beers, Bob Sleigh by Bishop Nick. A premium ale at 5.1% (not sure whats so premium about it). This might just be me transitioning back off of nights but I’m not feeling this one. No real smell and nothing much to the flavour. It doesn’t taste bad, just not really any discerning flavour. Which is a shame as I seem to recall having a Bishop Nick Porter earlier on this month and it being good. On the plus side the Nier Automata demo on PSN is pretty cool. It’s a character action game (Bayonetta, DMC) with some bullet hell elements. As with all character action games, I’m rubbish at it but it was really fun. Now to try and get through all my current games so I can play the original before this is released in March. Today I learnt that I cant count. I should have two bottles left after this one but I have three. Luckily two of them are christmassy ones so I can pretend that I planned to do two bottles for christmas day all along. Now then, here we have Just another IPA from Kees brewery standing at 6.5%. Now the aroma in this one might have a hop that I dont recognise, I like it though. Theres also notes of roasted apples, yeast and a bitter nut. Taste is hoppy bitter thats just on the right level, honey, bread and quite malty. A very medium body, enough carbonation and leaves you with a bitter taste. Nice. This is Dipa v9 from Cloudwater brewery standing at 9%. This neither hid the strength nor let it become too much. You could still smell and taste a bunch of flavours, and it didnt make you recoil after each drink. Speaking of aromas, there is a mix of citrus fruits and some hops. While the taste is fruity, lightly bitter maybe better to say lightly peppery, touch of sweetness at the end and a smack of alcohol thats just right. Id actually say the texture is just over a medium but not quite a heavy one. Carbonation is fine and plentiful. A very well put together beer that I would say try it if you can. Christmas Ale by Allendale. That’s what I have this morning (last night shift of the calendar). Looks like, smells like and tastes like an ale. Its perfectly drinkable but there is nothing really of note about this beer. A little bit of a tang in the taste. There is some hops to the smell. The only thing above average is that its 7%. Again, nothing wrong with it, just nothing stands out. The aroma is red wine, grape, and chocolate mixed with cardboard. Taste is red wine, sweet like a brown sugar, a hint of bitter but cannot place what, coffee beans and a whole lot of chocolate. Aftertaste is dusty chocolate that fades into red wine finish. An oily texture thats not clingy, with low carbonation thats easy to drink. This has been Dubbel from Emelisse brewery standing at 7.5%. And I want another one. Actually I just thought of something. At work we have these Cocoa nibs with a syrup on them. That are sweet, chocolatey and bitter. Rings any bells?